To reiterate a point from the last post, nationalism appears here and there in South Vietnamese music, not in one place. Strong arguments will necessarily come from a broad survey of songs, not a few. For now, however, I will zoom in on just one song in the hope of illustrating certain aspects of nationalism in the Republican South. What is Ba Lần Mẹ Khóc, whose title I have Englished as Thrice Mother Wept, opting for old-style “thrice” over “three times” in order to cut down on syllables? Like Tuổi Trẻ Chúng Tôi, it was recorded only once in South Vietnam. KEEP READING! 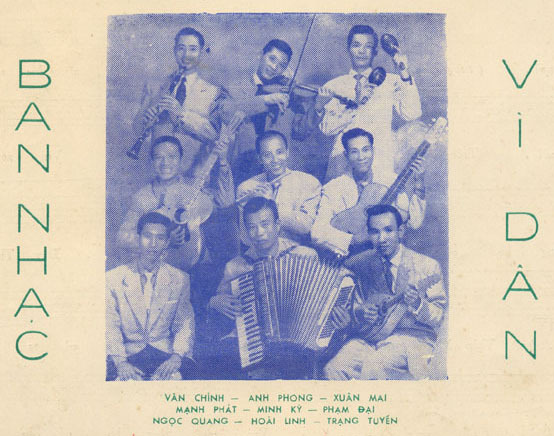 This is the first of two posts on music in South Vietnam. Here is the second post. The first time at the Association of Asian Studies (AAS), I presented a paper on ethnic nationalism in South Vietnamese music. Thanks to a nice line-up that I put together (including the Australian anthropologist Philip Taylor as chair and discussant) and auspicious scheduling (right after lunch time on Friday and without another panel on Vietnam at the same time), a lot of people in the field showed up to this panel. It seemed, indeed, as if Keith Taylor was the only big name from the U.S. that was missing. (I did see him a few days later at Cornell.) The sizable room was nearly packed: a most desirable outcome for a conference panel anywhere. Alas, it was a successful outing in most respects but for me. KEEP READING! The Cornell Vietnam Speakers Series asked last week, “What is on your mind about the Vietnam War as we approach the 40th anniversary of its conclusion?” Here are the things that I jotted down between grading and seeing students as the semester wound down.